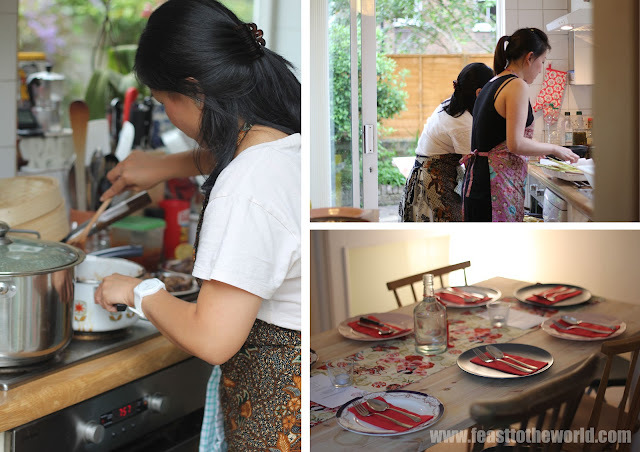 It has been a while now since I've came to learn about the Two Hungry Girls Supperclub. It is run by two lovely girls - Leigh, a fellow Singaporean who also happened to be a baking supremos (she used to work as a pastry chef in the Michelin-starred Sketch) and now run her own company Craft Cakes and Shu, who is a fellow passionate foodie , hailed all the way from Malaysia and now based in London (Our first encounter was over a conversation of mutual love of salted fish and what to do with it!) Beside being wildly passionate about food, she also dedicate her time with the charity organisation Action Against Hunger. After numerous time of missed opportunities (their tickets sell out F-A-S-T! ), I managed to grab myself a seating the day before the supper club due to a last minute cancelled. On the day I arrived, I was immediately led to the dining area and offered a glass of refreshing Ice Longan Spiked Tea by one of the amiable helper on the day Rosie. The dining table were beautifully laid out with floral runner and the low-lit lighting created a soothing and cosy ambiance. Being the first diner to arrive, I was able to take a few quick shots of the kitchen scene before the manic began, but saying that, the kitchen looked immaculately laid out, just like the dining room. Having previously worked in a professional kitchen obviously helped the pair to plan and organise the dinner with immaculate precision. The rest of the diners arrived soon after and we were then led to the garden to have a little mingling session and being so well prepared in advance, even the two hungry girls join in the little getting to know each other. And in case you are wondering, I did peeped into the kitchen and there ain't no little elves helping them with the cooking. We then went back to the dining room and duly sat down for the meal. The feast began with a cold silken tofu with century egg toppings. The beancurd was soft and delicate, the toppings contained one of my childhood fear - century egg - duck egg which have been matured in volcanic ash thus giving a distinctive greenish colour and strong pungent flavour. It work perfectly here and maybe because my palate has matured over the years, I actually rather enjoyed the punchy toppings and the hint of dried shrimps paired with this beautifully. The pork skewers arrived looking like a work of art. 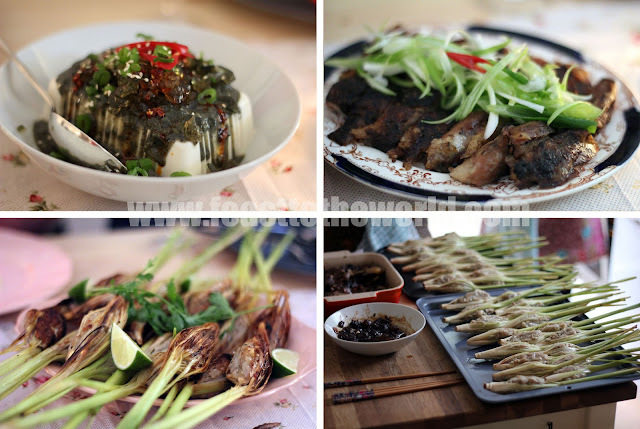 The skewers were in fact lemongrass that had been slit open and the well-seasoned minced pork were encased within. The lemongrass imparted subtle aromatic fragrant to the finished dish and a very moreish delights it was. The 5-spice Szechuan Peppercorn duck were served alongside some fresh lettuce for use to wrapped the duck with and was a great alternative to the otherwise ambiguous peking-duck....but with much more perfumed aroma. The duck were tender and did not have that greasy feel that you normally associated with duck. Scoop of steamed rice were offered and then it was the entrance of the mains. Slow-braised pork belly were rich and has cooked for such a long time that it simply melts in the mouth; the sambal kangkong (one of my favourite vegetable dish of all times) were spicy and had a good crunch to the bite, some of the diners felt it was too hot, but for me, it was perfect and I finished the whole plate off. The sizzling sounds of the hot oil being poured over the steamed sea bass created a sense of excitement as we waited patiently for the dish to be brought over from the kitchen. The fish itself were beautifully cooked and the sweet and lightly salty sauce paired beautifully with the delicate flesh. It was so good the we spent a good few minutes trying to figure out what went into the sauce before we decided to get it straight from the chef's mouth. 'Light and dark soy sauce, brown sugar and that's it! ' said Leigh. This too, deserved a mention, one of the diner, Su-mei filleted the whole fish before our very eye with such skills that it was quite astounding. She managed to lift the bone away from the fish without ruining the beauty of the dish! Next was the garlic chives with tofu and one of my favourite on the night, Hunanese beef. 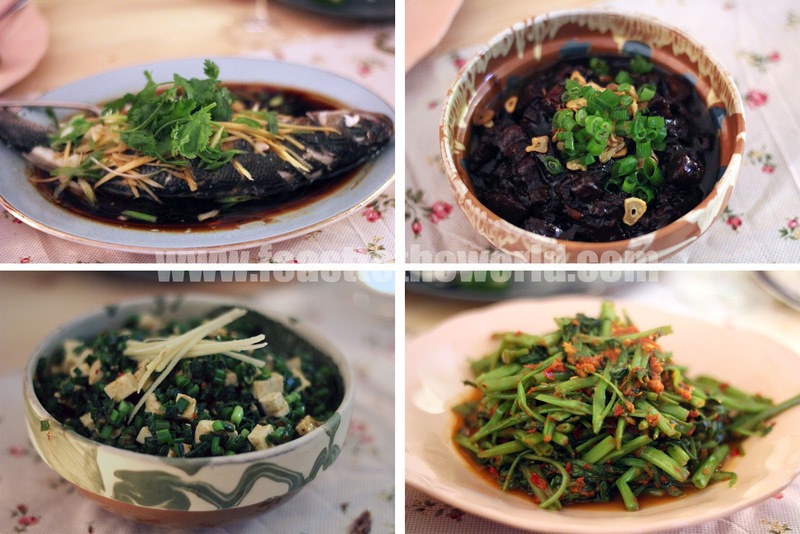 The beef was quite unique as it contain ground cumin which is a signature of Hunan cuisine. 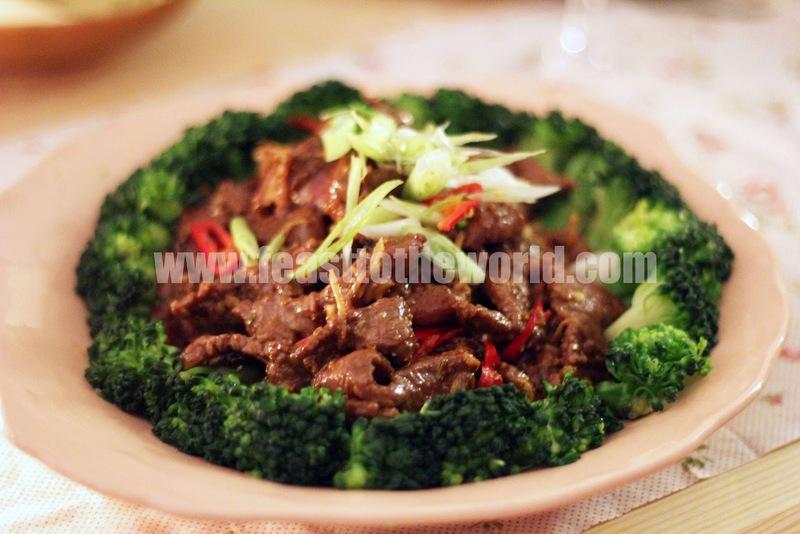 It was aromatic and spicy and due to the 'velveting' process which the girls used while cooking the beef, it's has that tender and ultra-smooth texture which was incredible pleasing. After the main meal, we were offered a palate cleanser and then the Soya milk panna cotta with peach and jasmine tea sorbet which were so good it went down a treat. The sugared-coated peanuts provided it with a delectable contrasting brittleness. 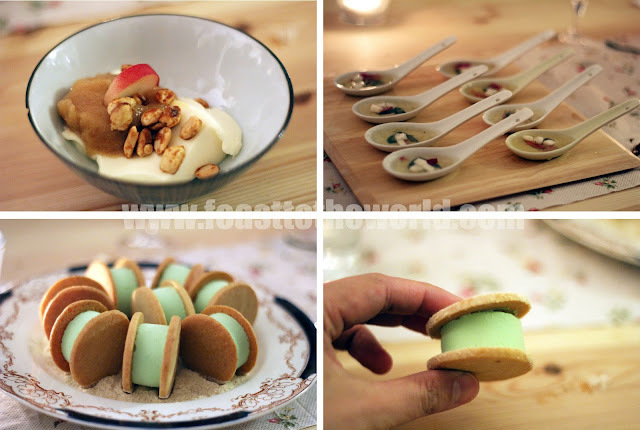 The second pudding of pandan ice cream sandwich and horlick sand or as I nicknamed it on the night 'Pandan On The Beach' were delicious and brought back familiar childhood flavours. 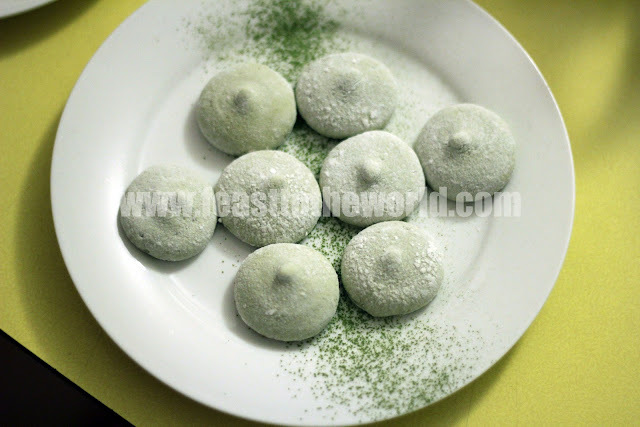 To finish, we were also offered a small petits fours treat of Matcha marshmallow, another brilliant demonstration of the fantastic patisserie skills from Leigh. The evening was entertaining with great company from the lovely diners and also from the amiable hosting of the two hungry girls as well as their helpers on the night. For more information on the Two Hungry Girls Supperclub, click here to visit the Edible Experience website for their future dates.